One of the most popular attractions in Death Valley National Park is Scotty's Castle, a two-story Spanish Villa in Grapevine Canyon that is neither a "Castle" nor, "Scotty's." In fact, the popular 32,000-square-foot compound was built in 1927 by Albert Johnson, a wealthy Chicago insurance executive, who constructed Death Valley Ranch for his health. How Johnson's ranch came to be called Scotty's Castle, is a tribute to Walter E. Scott, who during a lifetime of shameless self-promotion, hustling and swindling, came to be known as Death Valley Scotty. Born in Cynthiana, Kentucky, on September 20, 1872, Walter E. Scott spent his early childhood traveling the harness racing circuit with his family. At the age 11, he left home to join his two brothers on a ranch near Wells in northeastern Nevada. Because of his experience with horses, Walter signed on with a horse drive to California in 1884. When he joined a crew surveying the California-Nevada boundary later that year, he made his first visit to Death Valley, beginning his lifelong love with this hot, barren region. In 1885, he took a job with the Harmony Borax Works and quickly rose to the position of swamper on the 20-mule teams that hauled borax across the Mojave Desert. After a stint railroading for the Southern Pacific, he returned to ranch life. 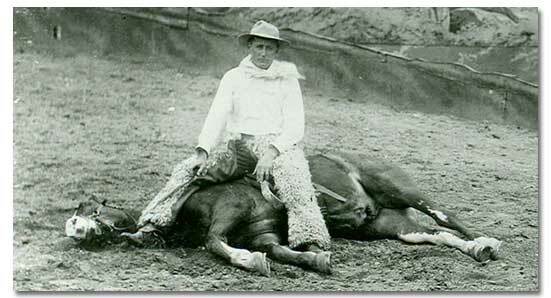 In 1888, at the age of 16, Walter joined Buffalo Bill Cody's Wild West Show as a stunt rider. Here he learned how to perform, touring the U.S. and Europe for the next 12 years. In 1900, while in New York City, he met Ella Josephine Milius, whom he later called "]ack." They married 6 months later and moved to Cripple Creek, Colorado where Walter unsuccessfully tried his hand at gold mining. Unable to rejoin the Wild West Show in 1902, Walter utilized his performance skills to convince a wealthy New Yorker to grubstake his fictitious gold mine in Death Valley. 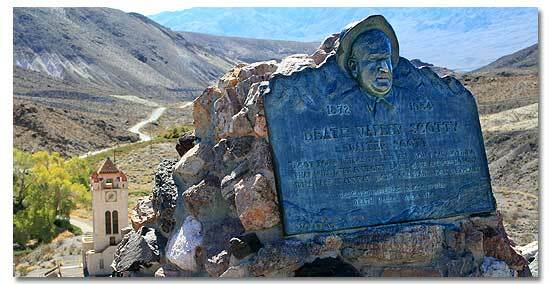 For the next two years Walter faithfully wrote his patron describing his lucrative strikes in Death Valley, but never shipped any ore. By 1904, after more than $5,000 had been invested, Walter boarded an eastbound train carrying a bag supposedly holding $12,000 in gold dust. When the bag was mysteriously "stolen" before he reached Philadelphia, newspapers eagerly picked up the story, which launched Scott on another of his lifelong loves -- his sprees of self promotion. Walter was soon boasting he could break the rail speed record from Los Angeles to Chicago. On July 9, 1905, with backing from a Los Angeles mining engineer, he chartered a three-car train, the Coyote Special, at a cost of $5,500. Arriving in Chicago in just 44 hours and 54 minutes, his train did indeed break the existing record for the 2,265-mile journey. "We got there so fast that nobody had time to sober up, " was the way Walter described the feat. The press reacted by inventing dramatic tales of his secret gold mine. At one point along the route, it is said that Walter signed a hotel register as "Scott, Death Valley." It did not take long to before this entry became his lifelong moniker -- "Death Valley Scotty." In Chicago, grubstaker Albert Johnson, then treasurer of the National Life Insurance Company of Chicago, was among the crowds at Dearborn Street Station to greet Scotty. Having previously supplied him with a few small grubstakes, Johnson grew more interested in Death Valley mining investments. In the winter of 1909, Johnson spent almost a month with Scotty in Death Valley. Though he saw no gold mine, he enjoyed the climate and its effects on his poor health. But by the time he returned the following spring Johnson concluded Scotty's gold mine was a scam. The truth surfaced publicly in 1912 when Scotty bragged that he had sold his mine for $1 million. In a law suit which followed, he confessed to a grand jury, "My hole in Death Valley is all a myth." After being discredited, Scotty retired from the limelight to his small cabin in lower Grapevine Canyon. But his friendship with Johnson, who frequently traveled west to visit the bogus prospector, continued to grow. He even paid Scotty $30 subsistence during this period. Scotty seldom lived with his wife , but she bore a child, Walter Perry Scott, in 1914. 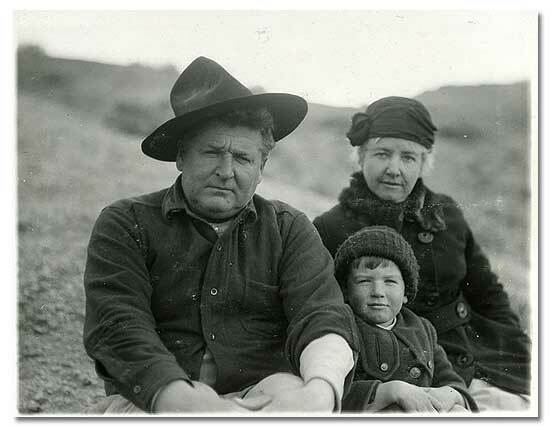 In 1926, Johnson decided to build a splendid ranch in Death Valley and began construction in 1927. Before construction was complete, Scotty was referring to the ranch as "my Castle." In 1929, Scotty went on another self-promotion binge, claiming among other things that he would set a new world airplane speed record, break the bank at Monte Carlo and purchase an entire string of polo ponies for his personal use at his Castle. After a week of speeding around Hollywood and Beverly Hills in a new car, his red necktie blowing in the breeze, reporters proclaimed him "America's number one mystery man." 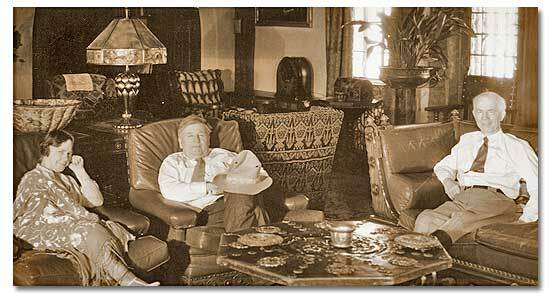 The stock market crash of 1929 severely limited Johnson's ability to complete construction of the ranch, and when he was forced to liquidate his business, he and his wife ended up spending much of their time at their Death Valley Ranch. This forced Scotty in 1930 to build his hideaway 5 miles down the canyon, near the site of his original camp. It became known as the Lower Ranch, for Scotty's sole use, possessing neither electricity nor indoor plumbing. In the meantime, various victims of Scotty's past swindles attempted to sue him for his ownership of the Castle. It became necessary for Johnson to prove that he, not Scotty, owned and financed construction of the Castle. He also paid off some of the litigants, including Jack, Scotty's ex-wife. The remainder were awarded Scotty's worthless mining claims by the court. In 1947, after his wife died and his own health began failing, Johnson attempted to sell Death Valley Ranch to the federal government. When this failed, he deeded it to the Gospel Foundation of California, a non-profit organization. On January 7, 1948, Albert Johnson died at the age of 76, leaving his ranch forever unfinished. Meanwhile, after hospitalization for an illness in 1951, Scotty returned to live in the Castle and each night regaled paying guests with his exploits over the past century. He had reached the pinnacle of his fame, becoming a tourist attraction in his own right. On January 5, 1954, Walter Scott, on his way to Las Vegas for medical attention, died at the age of 82. He was buried on the rocky hill northwest of the guest house at Scotty's Castle next to his dog Windy. In July 1970, the National Park Service purchased Scotty's Castle for $850,000. It has since become one of the most popular features of Death Valley National Park. Scotty's Castle is CLOSED until further notice due to flood damage, and is not likely to re-open to the public until 2020. All entry to Grapevine Canyon and Scotty's Castle district is currently prohibited. More information is available about this extreme flood and recovery efforts.